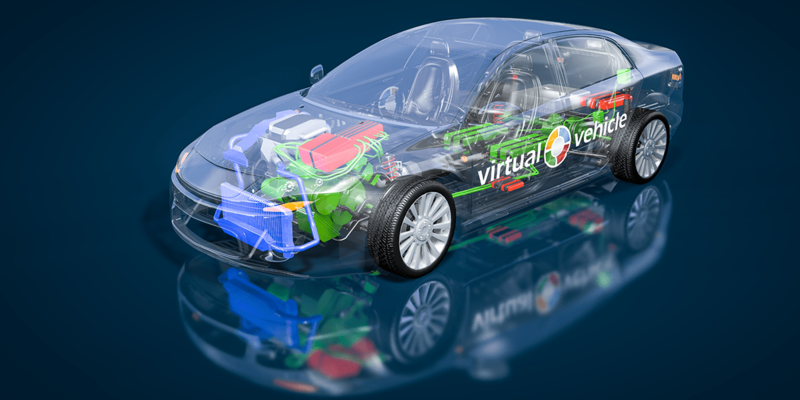 VIRTUAL VEHICLE has adapted advanced coupling algorithms which are used in its “Independent Co-Simulation”-Platform (ICOS ). With these methodologies, different time constants within a system can be handled smoothly and different engineering domains can be easily integrated. Using this platform, a variety of mechatronic problems can be efficiently developed, analyzed and validated. In today’s development processes, the modeling and simulation of dynamic systems is a fundamental prerequisite in order to come to early concept decisions for the end product. It is not sufficient to solely model, simulate and test individual components or modules. Rather, depicting the interactions of a large number of functions (by means of simulation models as well hardware components from different domains) and therewith, the representation of large(r) sub-systems (up to the full vehicle) are mandatory. Over the course of the last decades, many domain-specific simulation tools have been accepted as a standard and widely used, for e.g. MATLAB/Simulink or Dymola for multi-physics modeling, SystemC for Electronics, ASCET for automatic control engineering or Flowmaster for thermal simulations. However, in most cases these tools are often tailored, especially towards individual physical areas. Thus, they tend to be limited with respect to their supporting heterogeneous simulation environments. However, in today’s development of new mechatronic systems, a comprehensive view is indispensable which integrates the many sub-systems and incorporates their interactions. The coupling of diverse, already established simulation programs (or the therein implemented models respectively) from the various engineering domains, represents a promising path for the simulation of the resulting overall system. In order to adequately cover the interactions, it is imperative for a co-simulation environment to support the exact interplay of the individual models up to HiL components (compare Fig. 1). Ultimately, only the complex, yet, controlled interaction of many models/components allows the design and virtual validation, respectively, of the entire concept or system composed of vehicle driver and environment. Figure 1: Example for domains/models, which must be coupled by modern co-simulation platforms. Traditional co-simulation platforms are usually limited to one domain, such as the calculation of the thermal management system of the simulation or the communication architecture with a heterogeneous set of tools. It is possible to model sub-systems with that, but with the restriction to one (or max. two, respectively) engineering disciplines. Along with this confinement, such frameworks can usually only treat problems with a limited dynamic range; i.e. the temporal behavior of the various models is similar, in fact often very slow (especially in thermodynamics). If models with significantly differing time constants shall be coupled with existing platforms, extremely small time-steps have to be used. Otherwise, an additional error is introduced (because the physically existing coupling of the models is not correctly taken into account) which – in the extreme case – can lead to a divergence in the co-simulation. To overcome this problem the VIRTUAL VEHICLE has adapted advanced coupling algorithms (such as Waveform Relaxation or Multi-Rate approach) which are used in its “Independent Co-Simulation”-Platform (ICOS). With these methodologies, different time constants within a system can be handled smoothly and different engineering domains can be easily integrated. Using this platform a variety of mechatronic problems, for e.g out of integrated safety, alternative drive trains and chassis control as well as active vibration compensation and safety-critical communication can be efficiently developed, analyzed and validated. Moreover, not only the vehicle alone stands in the focal point; even vehicle environment as well as the driver’s behavior can also be taken into account (see Fig. 2). Figure 2: Not only the vehicle alone is the focal point. Rather, an interdisciplinary modeling of the vehicle, including driving behavior and environmental influences is mandatory. This cross-domain approach allows for the estimation of influences stemming from the quality or the depth of the models and non-linearities onto the overall result (e.g. fuel consumption) as can be seen in Fig. 3. Figure 3: ICOS overview: The cross-domain approach enables an estimation of influences stemming from the depth of the quality and depth of the model as well as non-linearities (for e.g. fuel consumption). By leveraging the possibility of combining different engineering disciplines it can be shown that innovative designs are possible. This is due to the fact that a realistic number of functions and their dynamic interactions can be considered (in a finite amount of computation time). This virtual validation enables a target-oriented development and verification (functional, thermal as well as acoustic) of novel solutions. This is shown in the next section by means of an example. The above example demonstrates how innovative systems can be designed if a realistic number of functional elements and their dynamic interactions are considered. Of course, it is also possible to cover aspects from other domains (e.g. acoustics, integrated safety, vehicle architecture,…) apart from thermal or electrical investigations. Further, different concepts can be implemented and compared to each other in a relatively simple, quick and inexpensive way on a simulation level. The validation of several implementation approaches at a very early stage of development supports the identification of the best concept, thus reducing (development-) time and cost – and significantly increasing the chances for a “First-Time-Right” solution. The enabler for this is a powerful co-simulation platform. ICOS supports the user with a simple handling and the integration of various simulation tools from different domains. Modern coupling algorithms ensure that the – in reality existing – interdependencies between different models are depicted adequately, not only within one engineering discipline but also across all relevant domains as well as all possible dynamic ranges.